UK Finance has reported modest growth in housing market activity since January, noting increased numbers of first-time buyer transactions and referencing government schemes aimed predominantly at such buyers, like the Help to Buy equity loan scheme and Help to Buy ISA. These schemes are typically geared towards new-build properties, where growing demand has been evident, in contrast to areas like buy-to-let. Whilst this is good news for the mortgage market, areas of home-ownership like new-build and first-time buyers can cause considerable concern to lenders. The need for more insightful property underwriting has never been higher, with a backdrop of economic uncertainty that could affect house prices. As previously mentioned, the buy-to-let market, whilst showing signs of resilience, has suffered recently, following tax relief and stamp duty changes as well as new rules for portfolio landlords causing hesitation on the part of some lenders to commit to financing. However, this uncertainty has provided opportunity for niche lenders in what’s becoming an increasingly specialist area not least in part due to those recent PRA changes. Furthermore, Paragon has said it expects to see £35 billion of buy-to-let mortgage lending overall this year. The company said the drop from £41 billion last year showed a step change in landlord activity; a strong response after all the changes affecting this market. 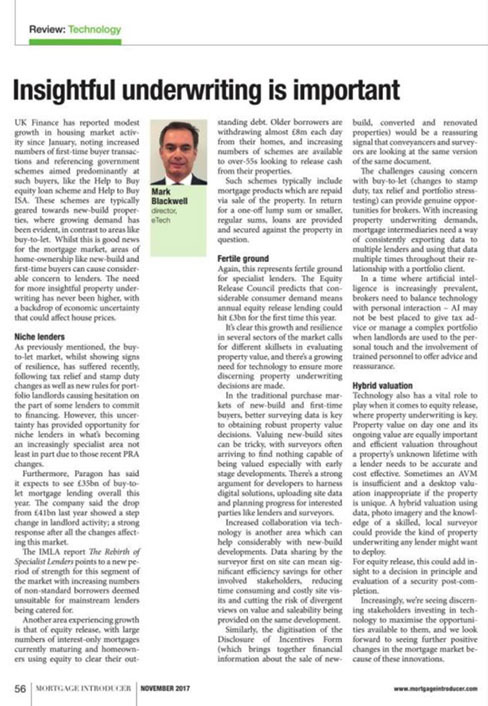 The IMLA report The Rebirth of Specialist Lenders points to a new period of strength for this segment of the market with increasing numbers of non-standard borrowers deemed unsuitable for mainstream lenders being catered for. Another area experiencing growth is that of equity release, with large numbers of interest-only mortgages currently maturing and homeowners using equity to clear their outstanding debt. Older borrowers are withdrawing almost £8 million each day from their homes, and increasing numbers of schemes are available to over-55s looking to release cash from their properties. Such schemes typically include mortgage products which are repaid via sale of the property. In return for a one-off lump sum or smaller, regular sums, loans are provided and secured against the property in question. Again, this represents fertile ground for specialist lenders. The Equity Release Council predicts that considerable consumer demand means annual equity release lending could hit £3 billion for the first time this year. It’s clear this growth and resilience in several sectors of the market calls for different skillsets in evaluating property value, and there’s a growing need for technology to ensure more discerning property underwriting decisions are made. In the traditional purchase markets of new-build and first-time buyers, better surveying data is key to obtaining robust property value decisions. Valuing new-build sites can be tricky, with surveyors often arriving to find nothing capable of being valued especially with early stage developments. There’s a strong argument for developers to harness digital solutions, uploading site data and planning progress for interested parties like lenders and surveyors. Increased collaboration via technology is another area which can help considerably with new-build developments. Data sharing by the surveyor first on site can mean significant efficiency savings for other involved stakeholders, reducing time consuming and costly site visits and cutting the risk of divergent views on value and saleability being provided on the same development. Similarly, the digitisation of the Disclosure of Incentives Form (which brings together financial information about the sale of new-build, converted and renovated properties) would be a reassuring signal that conveyancers and surveyors are looking at the same version of the same document. The challenges causing concern with buy-to-let (changes to stamp duty, tax relief and portfolio stress-testing) can provide genuine opportunities for brokers. With increasing property underwriting demands, mortgage intermediaries need a way of consistently exporting data to multiple lenders and using that data multiple times throughout their relationship with a portfolio client. In a time where artificial intelligence is increasingly prevalent, brokers need to balance technology with personal interaction – AI may not be best placed to give tax advice or manage a complex portfolio when landlords are used to the personal touch and the involvement of trained personnel to offer advice and reassurance. Technology also has a vital role to play when it comes to equity release, where property underwriting is key. Property value on day one and its ongoing value are equally important and efficient valuation throughout a property’s unknown lifetime with a lender needs to be accurate and cost effective. Sometimes an AVM is insufficient and a desktop valuation inappropriate if the property is unique. A hybrid valuation using data, photo imagery and the knowledge of a skilled, local surveyor could provide the kind of property underwriting any lender might want to deploy. For equity release, this could add insight to a decision in principle and evaluation of a security post-completion. Increasingly, we’re seeing discerning stakeholders investing in technology to maximise the opportunities available to them, and we look forward to seeing further positive changes in the mortgage market because of these innovations.